I just returned from the Old City in Jerusalem. Tonight begins Tisha B’Av, the 9th day of Av, during which is said that the First and Second Temples were destroyed and Jerusalem herself was left in flames and the people were exiled. This is a day of fasting and reading Eicha, the book of Lamentations. While I do not connect with this holiday on a religious level, meaning, I don’t pray for the Third Temple to be rebuilt; I don’t feel that it’s such a bad thing to be living outside the land of Israel and that all Jews do not need to return to Israel; I am not in any rush for the reestablishment of the sacrificial cult – I love being a Rabbi in California and I can’t imagine trying to get the blood stains out of my husband’s clothing every day after he came home from the Temple service since he is a Cohain. What I do connect with on Tisha B’Av is the historical significance of this day. We can say for sure that there is historical proof that the city of Jerusalem and the Temples were destroyed, first by the Babylonians and then by the Romans. We can say that so many Jews/Israelites were killed in the city of Jerusalem and we see this evidence in the burnt homes that are found still buried under the streets of today. We know that there was pain in the alleys and we know that so many died. I lament over the destruction, the pain and the death. But I hold hope in today and the future. Tonight, I joined with some friends and the Masoreti (Conservative) movement at Robinson’s arch, at the very edge of where the Western Wall and the Southern Wall come to meet. In some ways, I find this space to be even more holy in that we are able to stand under the arch that led up to the Temple Mount. That on the Southern Wall, we are able to see the remnants of the gates that the people entered when they went to visit the Temple, the Beit haMikdash. That tonight, we sat on the very street where people passed to visit the mikvah before going up to the Mount and also visited the stalls to buy what they needed for the sacrifices. And what was truly chilling was the cool wind, or ruach, that swirled around us, even though we were in an area that one would think was protected from the elements. That on this street we sat amongst the rubble, the stones that were cast down from the top of the Temple Mount. We sat with the destruction in front of us and my mind could only wander to a place 2000 years ago and through reading Eicha, I could hear the cries and feel the fire. Following the haunting chant of Eichah our service concluded with all of us joining together to sing Hatikvah, Israel’s national anthem. How appropriate it was to sing this song of hope and the future. How appropriate it is that at this time, while we remember the destruction, we also remember that today is the future. Yes, Jerusalem was destroyed 2000 years ago, but we are here now. The people have returned. The Jewish people hold on to Jerusalem today, and we will not let her go. However, there was still some sadness around me. As we walked to the Kotel plaza, the place where people go to visit the Western Wall, the mechitzah, the wall that divides the men from the women (so that a man should not be distracted from his prayers by the sight of a woman or her voice) was extended even further into the plaza. While it was awesome to see so many people sitting on the ground with copies of Eichah, it was sad to feel that this is not my place unless I adhere to the rules of the Orthodox. A young woman and her parents were talking in front of me in the plaza and she told her parents how she was just yelled at by one of the “Kotel Police” (who will ask you to cover yourself up with one of their scarves if your legs are showing too much or your shoulders are not covered) who told her that she could not stand where she was for she wandered into the “men’s side.” She was so disturbed and angry because they were so rude to her. Her father looked at her and said that this was crazy! And then they looked over at me, standing so close. 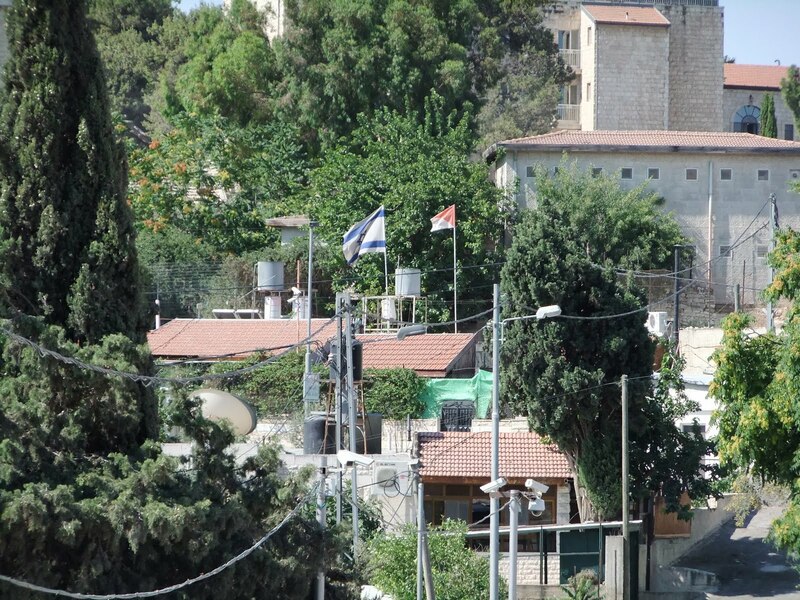 I smiled and said, ‘yes, I know and I agree.’ To which her father came up to me and said, ‘was it not because the Jewish people could not get along, that they argued so much, that the Beit HaMikdash was destroyed?’ ‘Yes’ I said. And he responded, ‘the Kabbalah teaches, that which seems to be real is fake and that which is real is fake! Now, I have to go find my son. Thank you, you have a beautiful neshamah! (soul)’ and they left. Yes, it is taught that the Temple was destroyed because the Jewish people could not get along; that there were too many divisions amongst us. Today, we need to listen to that lesson and rather than trying to make the mechitzah, the barrier larger, we need to tear it down and try to unite as one people. Tonight, I experienced Tisha B’Av in a way I never expected. To stand here in Jerusalem, to be in the place where it happened, was moving and awesome. And now, as we approach our final week here I have to ask, how will I take Yerushalayim l’malah, how will I take Jerusalem home with me to keep it in my heart but also to share it with so many others? I kept looking at the forecast and was a bit nervous that we were going to be traveling to Eilat, crossing the border into Jordan and up to Petra and it was going to be in the 110’s! Really!?! What was I thinking going there in this kind of heat? But there is no choice if we want to go this summer so the heat was a reality. Thankfully, we were at the Dead Sea and Ein Gedi a few days before and already experienced the heat. Words to the kids (and ourselves) before the trip: ‘Guys, it’s going to be hot! We’re going to sweat and we’re going to get dirty! We’re all going to be in it together, so no one gets to complain!’ I’m proud to say, no one did! Our experience began in the morning from our hotel in Eilat, the Royal Tulip. Anyone thinking of staying there in the future, go for it! Very simple, but beautiful! And the breakfast buffet is amazing – even the Israelis’ loved it so much that they were stuffing their bags with breads and fruit to enjoy for the rest of the day. The taxi dropped us at the Rabin border station and there we met our guide and others who were on our bus. I’ve heard rumors that crossing the border into Jordan would take hours and just be prepared to enjoy the obligatory gift shop. Surprisingly, we were through the Jordanian border in a matter of minutes and aboard our bus driving through Aqaba, the Jordanian city that shares the Gulf with Eilat and whose King is working to rebuild sections of the city, making it a grander destination city. As we started out of the city, our guide described the landscape and gave us a few minutes of quiet time to catch a small nap. 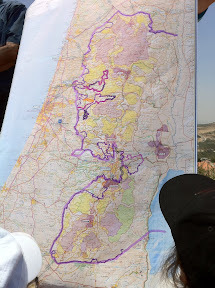 When the bus stopped, our guide welcomed us to the Jordan Starbucks – a 14 year old boy, with a small shelter, gas burner, small table, and glasses for coffee. Oh yeah, and a mom and baby camel. Quite convenient when ordering a cappuccino. Finally, we arrived in the area of Petra, also known as Wadi Musa – Moses’ Valley, where the Israelites traveled through during their 40 years of wandering and it is said that Moses struck the rock seeking water. 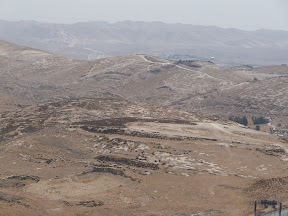 It is from here we see a mountain top that is said to be the place where Aaron, Moses’ brother, died and was buried. A golden mosque glints on the top of the mountain. We get off our bus and begin the walk to the front of the park. Conveniently, there is a store, Indiana Jones’ Gift Shop. Our guide informs us that our journey will take us four kilometers down into the canyon. “Down” being the operative word. He explained that there would be numerous ways that we could return: by foot; horse and carriage at $30/person; camel for one part of the way; donkey for another; and horse for only the top section. No, we were not going to be able to reinact the scene in Indiana Jones by galloping through the canyon to the great Treasury. Oh, well, nice try. Petra with it’s beautiful carved facades were created by the Nabataean people some time between 100 BCE and 200 CE. It was the center of the trade route and a great location to collect taxes as people passed through from different trading areas in the region. As we journey down the four kilometers, we are struck by the beauty of the rose colored canyons. Every corner we turn is a new experience. On the sides of the canyon walls we find water channels used during the Nabataean and Roman times. But finally, we turn one more corner and before us slowly emerges the Treasury, the building we have been waiting to see. It’s incredible to think that that this has been hidden from western eyes until 1812. The grand buildings in Petra are deceiving. When one looks upon them, one assumes that there are many rooms and this must have been some beautiful home of a very wealthy person. Half of this is true, it did belong to someone quite wealthy, but it is their final resting home. Each one of these buildings are tombs. Nothing more. There are no labyrinth of rooms inside these great facades, only a grand exit for someone from this world into the next. Each building is carved into the stone in a most unusual way – from top to bottom. The craftsmen had to carefully plan exactly what they were going to do, and with the help of scaffolding, they would carefully carve the design into the rock from the top to the bottom. The Treasury got it’s name because of the large urn carved at the top. Grave robbers thought for sure that it must hold some large amount of treasure and would shoot at the urn, hoping to break it and spill it’s contents. After a number of shots, they finally figured that there was no such treasure and moved on. Each building in Petra is more and more beautiful. The Treasury is only the beginning. One starts to see Roman influence as we move along Roman paved roads and see how they too built their own tombs into the mountain along with those who came before them. The Byzantines also added their own monastery which is reached by over 900 steps. It was 112 degrees that day, we decided not to climb the stairs! We stopped at the bottom of the canyon and our guide escorted our family into a restaurant and bid us farewell. He and the rest of the group would meet back at the bus in two hours and we were left on our own to explore the canyon until 7:30, at which time, we had to find our way back to the travel office so we could be transported to our Bedouin camp site for the night. We were grateful to have the extra time to explore and not worry about having to rush back to the bus. As we made our way back from the bottom of the canyon, the colors began to change with the changing sun and again there was always something new to see. DovLev and JediYeled fulfilled their mission of riding a camel and a donkey that day but we passed on the carriage ride back to the top – it looked a bit bumpy over the Roman cobblestones. Every site was beautiful – even the bathrooms were beautiful as they too were carved into the rocks. As we wove our way back up through the canyon we were inspired by a man singing a beautiful Halleluyah. So what do the Cohen’s do…sing of course! And the canyon walls reverberate the sound so beautifully! Finally, we reach the top entrance, get some ice cream and sodas, and head to the travel office to be driven to our Bedouin camp. Funny thing about this night, it cost us $10/person more to sleep in tents rather than the hotel. But in the end, it was very worth it! We were the only ones in the camp when we arrived. We were greeted by a Bedouin host who showed us to our “rooms,” a large tent with a metal frame. Each room had two mattresses with very soft sheets and each room was separated by fabric alone. Yes, it was a “Goodnight John Boy” kind of evening. Once we settled in, we all ran for the showers, masked by the tent fabric of course, but with modern plumbing. While we forgot to bring towels. it didn’t matter, in that heat, we dried before we could even get our clean clothes on. Our host showed us to the area JediYeled picked for us to eat dinner. A wonderful nitch in the rock with cushions and a low table. He and another Bedouin host started bringing out platter after platter of salads, chicken, rice and drinks. There were only six of us, but they must have thought we were bringing hundreds of friends. Within seconds of the food being uncovered, five wasps quickly joined our feast and we ran calling out for Ahmad to help us move the food to the inside tent. Away from the wasps we were finally able to enjoy the amazing delicacies. Another group shared the campsite with us, however, they were at a host home for the evening. While the electric lights would normally go off at 8:30 pm, they needed to wait for the other group to return. Try as we might, we could not keep our eyes open. The older Bedouin who spoke no English, brought a simple instrument with a square body, one string and played with a bow to play us a Bedouin song. That was it, we were exhausted and were fast asleep under a desert sky. We woke to a warm morning with coffee, cheeses, honey, breads, vegetables, and yogurt. In no time our bags were tossed up to and tied to the top of our jeep for our trip to Wadi Rum. We meet Isa, our driver and guide for the day. He is a retired school teacher now working as a guide in order to help supplement his very small retirement and provide for his family, including one in university and another about to start. Our first stop was to Little Petra, a small area that few people see during their one day journey to Petra. It too has beautiful tombs, but also caves that were used as homes. Isa explained to us that he grew up in Wadi Musa and during some of the winters during his childhood there was so much snow that he and his family would join other families in the caves in the canyon. The canyons were a natural barrier to the harsh weather and a safer place to live for the few months. A striking surprise was the painting found on the ceiling in one of the caves dating back to the Nabataeans. The colors are bright and the image of the cherub is clear in the center. A secret held by the caves for generations. After Little Petra we began the climb out of Wadi Musa south to Wadi Rum. Here we would meet the desert in a way we could never imagine. I have hiked through the Sinai and the rock canyons make you feel small, but here, in this desert, you can’t help but feel insignificant for the desert goes on and on, untouched except by one or two jeeps we encounter during the entire day. There are no roads and we are amazed how Isa knows his way through these ever changing sand dunes. The numerous rock formations, from arches to balancing rocks are his gps. Again, the colors are incredible and every turn is exciting. Of course, being in a jeep affords us the opportunity for some crazy donuts on some areas of packed sand and driving down steep sand dunes, much to the delight of JediYeled and the rest of us hanging on praying the jeep will not flip over. JediYeled’s squeals of joy encourage Isa to push his jeep even more and he really knows his jeep! We stop for lunch in the shade. Isa unloads the back of his jeep with food prepared by him and his wife. JediYeled gets to help light the fire and skewer the vegetables. What boy does not like to play with fire and sharp sticks? And in the desert, sure, why not? As I look out from where we are, there before us is a valley that is breathtaking and inspirational. I cannot help but think that it was here that the Israelites, 600,000 men, 2 1/2 million people in total, came through this place. As I looked out into the vast space, I could imagine the tents and masses of people, each in their own tribal area. It is here in the desert that the Torah comes to life and the journey seems to play out before me. We continue through the sand and rocks. For hours we are alone in the vast wilderness. But then Isa brings us back to the paved highway leading us back south to Aqaba and the border crossing. We bid Isa goodbye and thank him for an adventure of a lifetime. (I have his email if anyone wants it and let me tell you, he’s awesome!) The desert holds secrets around every corner and within every canyon. Each moment is exquisite with the changing colors of day into night. Voices from the past call out from the sand and our songs are co-mingled. And Israel calls us back to her borders, just as the Israelites were called to enter her land. Our journey might not have been 40 years, but the memories will last as long if not longer.